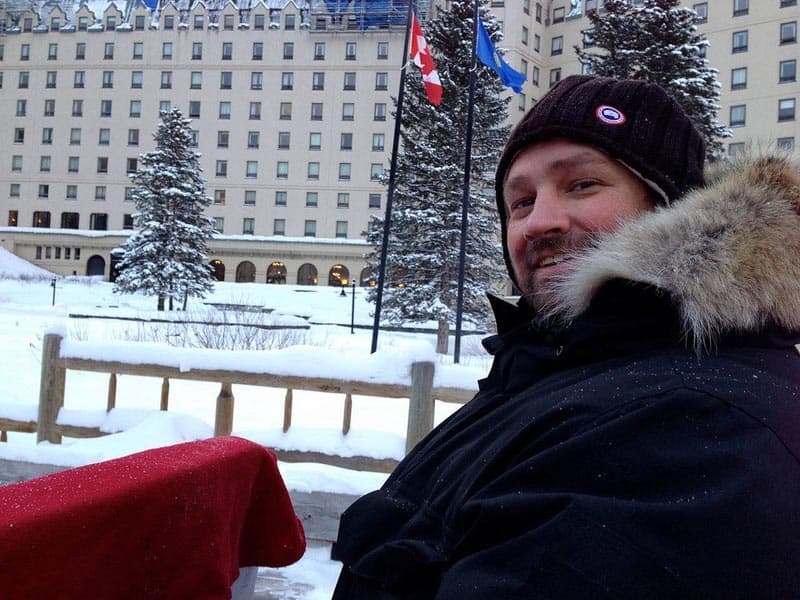 Alberta gets cold in the winter, but that doesn't mean you can't be cool! Dressing properly and armed this guide, a winter vacation in Canada's most beautiful province is an experience you'll never forget. We've had the pleasure of visiting Alberta three times in the winter and we're ready to go back for a fourth! To celebrate embracing the cold we want to share the coolest things to do in Alberta this winter. 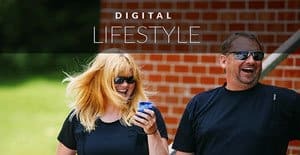 Trust me, you'll be the envy of all your friends when you share these experiences and adventures on your Instagram feed. So what are you waiting for? Book your winter getaway to Alberta today! It's not only the coolest thing to do in Alberta, it's also the most heartwarming. 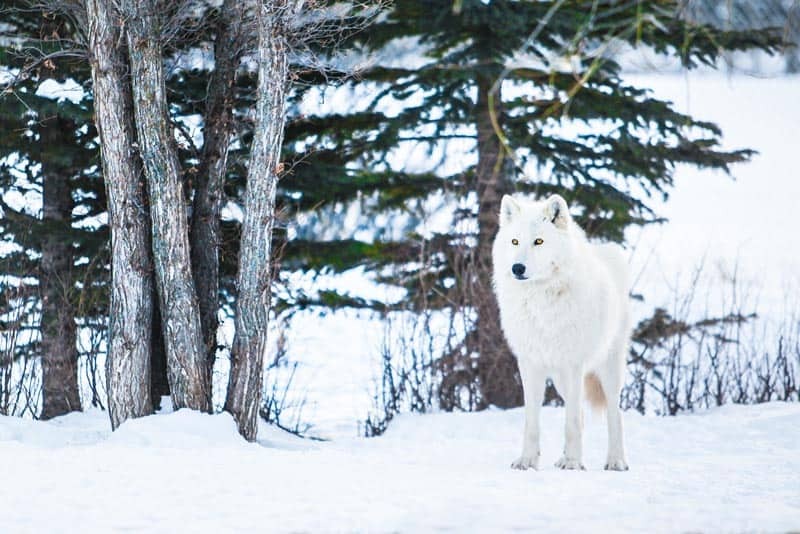 Visiting the Yamnuska Wolfdog Sanctuary just 60 minutes outside of Banff will put a smile on your face, but also make you stop to think about the consequences of human actions. The sanctuary rescues wolfdogs, rehabilitates them and finds new and loving homes for them. Visitors can sit with the wolfdogs and watch them interact and behave in their natural habitats. 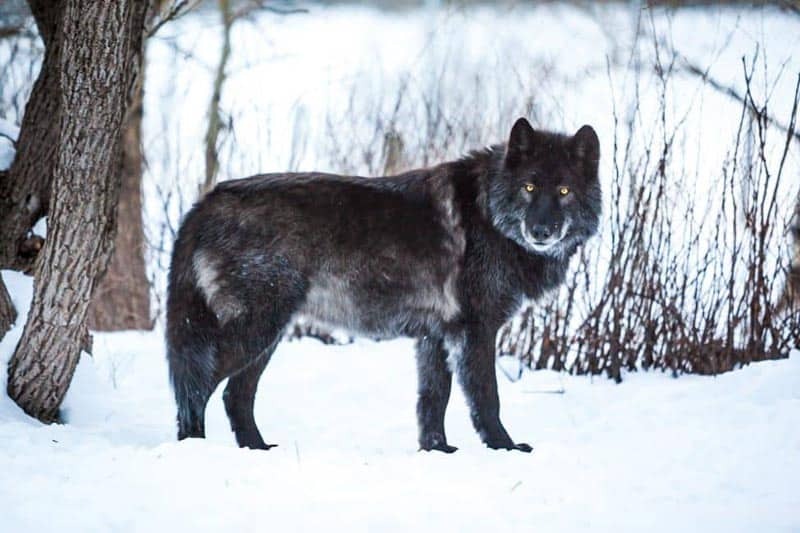 Depending on the percentage of wolf in their blood, wolfdogs can range from being timidly friendly to nearly wild. You cannot approach them, but as they become more comfortable with you in the large enclosure, they may stop by for a little loving and to eat out of your hand. What on earth is skijoring you ask? It's a mix between cross country skiing and dogsledding. 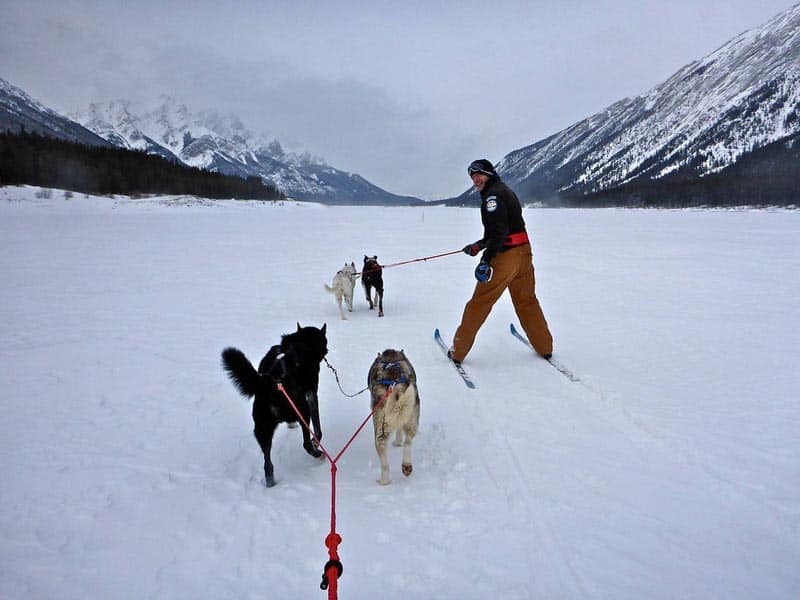 Skijoring was invented in Norway, but Alberta has embraced it. 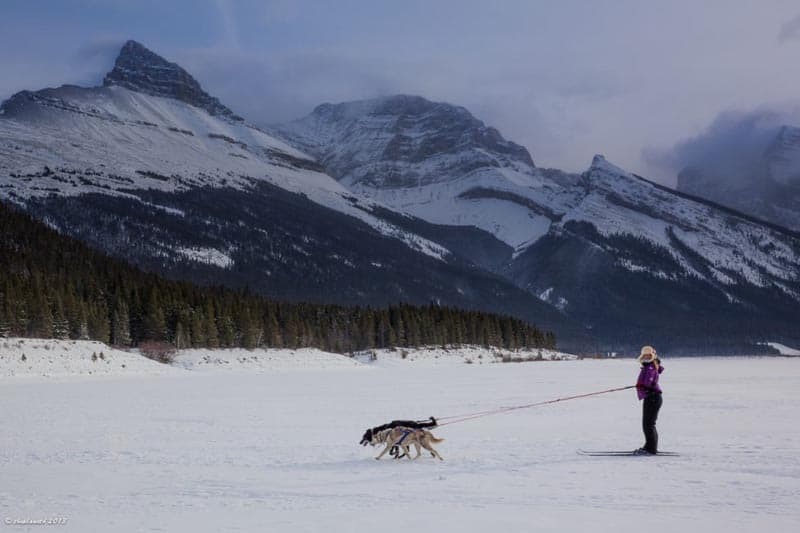 We met Russell Donald of Mad Dog and Englishman, Sled Dog Expeditions at Spray Lake outside of Canmore for our day of playing on ice with dogs. He asked us about our cross country skiing skills and we admitted “It's been awhile” We proved that comment right when we stepped on the ice and took our first glide only to fall flat on our faces. Not ones to give up and we pushed on. After a few minutes, we got our balance and managed to stay upright long enough to be hooked to the harness of our two eager dogs who took off at break neck speeds along the ice. Skijoring was a thrill of a lifetime and we couldn't stop laughing the entire trip around the lake. Each time we fell, the dogs looked back at us in disgust as if to say “come on man, you're cramping our style!” All they want to do is run and if you slow them down, they are not happy. Once you get your balance and the hang of things, it's smooth sailing as the dogs literally pull you along. Enjoy our video round up of our Alberta experiences with dogs! If you are looking for an adventure that gives you the ultimate adventure travel bragging rights, ice climbing in the rocky mountains is a must. Canmore is the ice climbing mecca of the world drawing top athletes to its routes each year to train and explore. 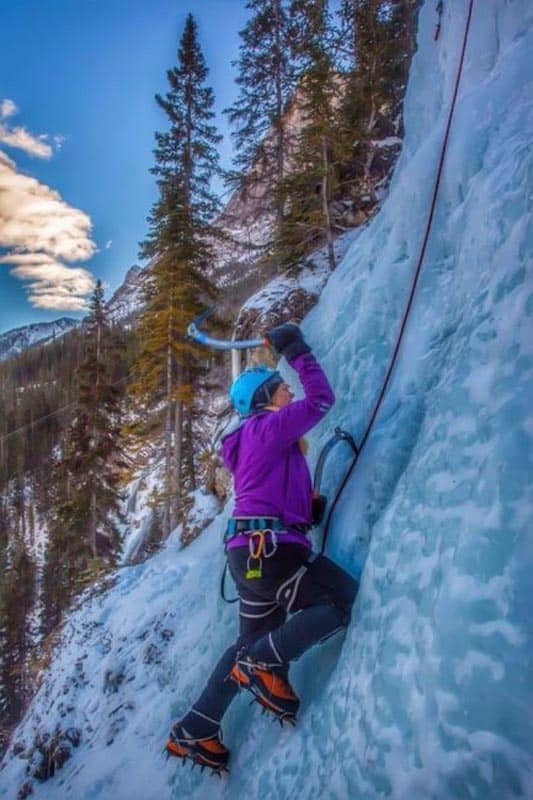 Yamnuska Mountain Adventures in Canmore offers guided ice climbing excursions. 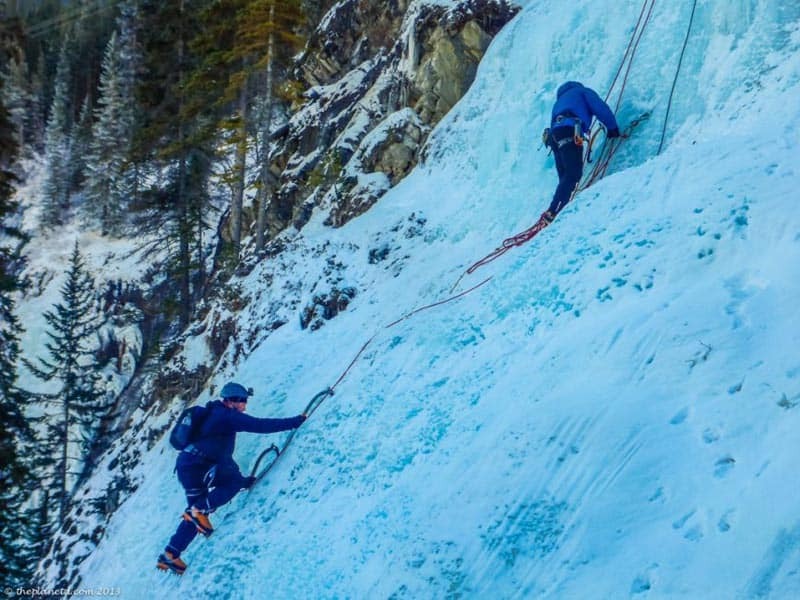 Even if you have never climbed before, you can go ice climbing in Alberta. Professional Rock Climbers set top ropes and routes for the novice climber making sure that everything is safe and secure. Armed with an ax and crampons, you are tied into a top rope and the swinging begins. The rest of the climb is kicking and swinging your way to the top as you try to find a place for your ice picks (in hand and on boots) to stick into the solid ice. What a rush! When you get to the top you feel like you have done the greatest adventure of your life and if you have been smart enough to shake your hands out on a regular basis you won't even have to feel the effects of the screaming barfies (as I did). I'll let you look that up. There is nothing cooler than pretending you're an Olympic athlete. There is no sport as unique to try as bobsledding. Who thought they'd ever get the chance to hop in a bobsleigh and barrel down the pipe with an Olympic athlete at steering the sled? Bobsledders from around the world train at Calgary's Canada Olympic Park ,and to make some money on the side, they take tourists down their home track! Feel the G-force push you down as you reach speeds of 125km per hour while banking the icy turns as you plunge down the World Cup track. 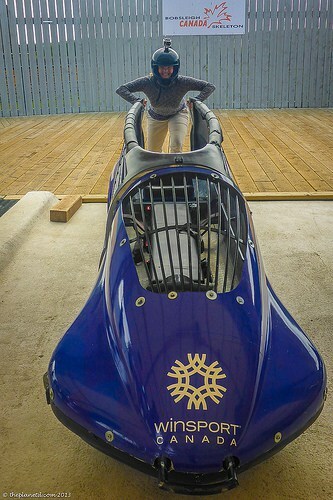 If you are up for something even more extreme, give the luge a try where it's just you, a tiny sled and a whole lot of courage! 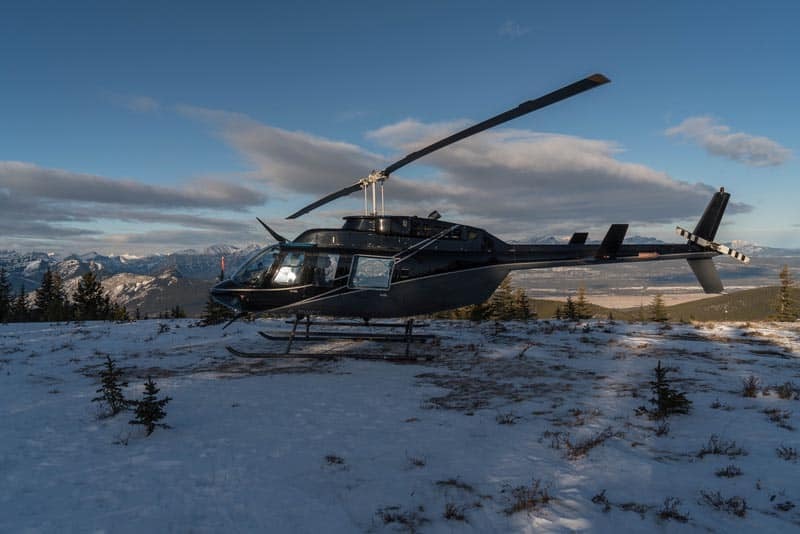 Located just an hour from Calgary and a short drive from Canmore or Banff, Rockies Heli is one of the premiere helicopter tour companies in Alberta. Our helicopter tour took over Banff National Park to witness the famous peaks like Mt. Assiniboine, The Three Sisters and Mount Lougheed. This adventure offers the added bonus of landing on a peak just outside the park to go snowshoeing where nobody else dares to go. When landing a helicopter on the top of a mountain, you can be sure you won't see crowds of people during your hike! There is absolutely nothing more Canadian than playing pond hockey on a frozen lake. And if you are going to visit Alberta in winter, you better skate on the world's most beautiful skating rink! Each winter the incredible sapphire waters of Lake Louise freeze over to make room for the best outdoor skating rink on earth. Located directly in front of the Fairmont Chateux Lake Louise, the rink attracts visitors from around the world whether they can skate or not! You can rent hockey gear from the hotel or from Wilson Mountain Sports and set up a fun game of pick up ice hockey. If you're not up for a game, that's okay, you can go to the other side of the lake and skate hand in hand with the one you love. 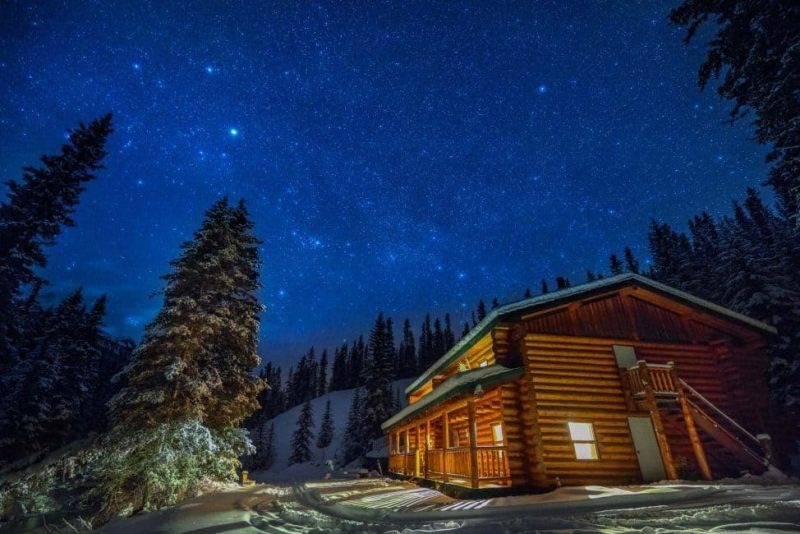 There are several backcountry lodges in Alberta that make for an amazing active adventure that ends with a luxurious stay in a remote lodge. We visited Sundance Lodge when exploring Banff and fell in love with the beauty of the area. If you are an avid cross country skier you can get to the lodge in a couple of hours. If you aren't into cross country skiing, you can try fat biking or snowshoeing instead! Lodges have wood burning stoves and fireplaces, cozy rooms with thick duvets and a personal chef to make the most of your stay. You can purchase wine or bring your own! 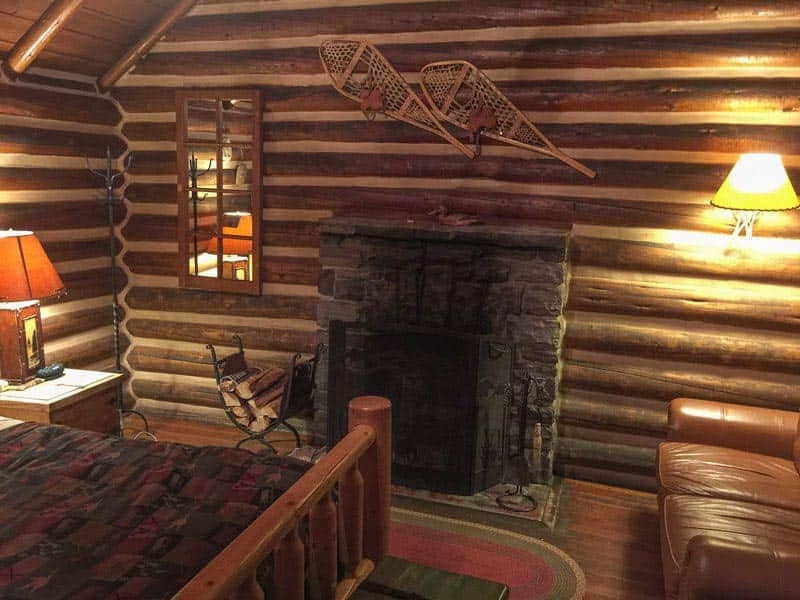 What is more romantic than sitting in a log cabin surrounded by the Rocky Mountains. 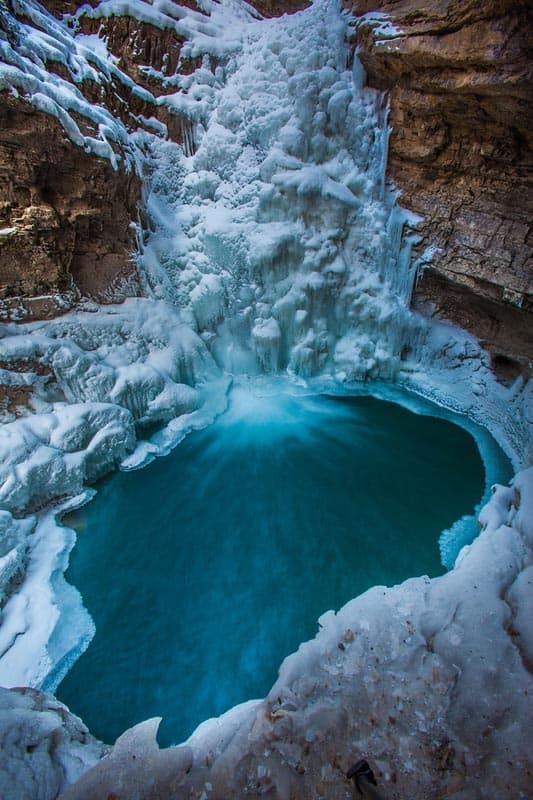 If an overnight trip to the back country isn't your thing, you may want to try a half day visit to the Johnston Canyon ice walk. 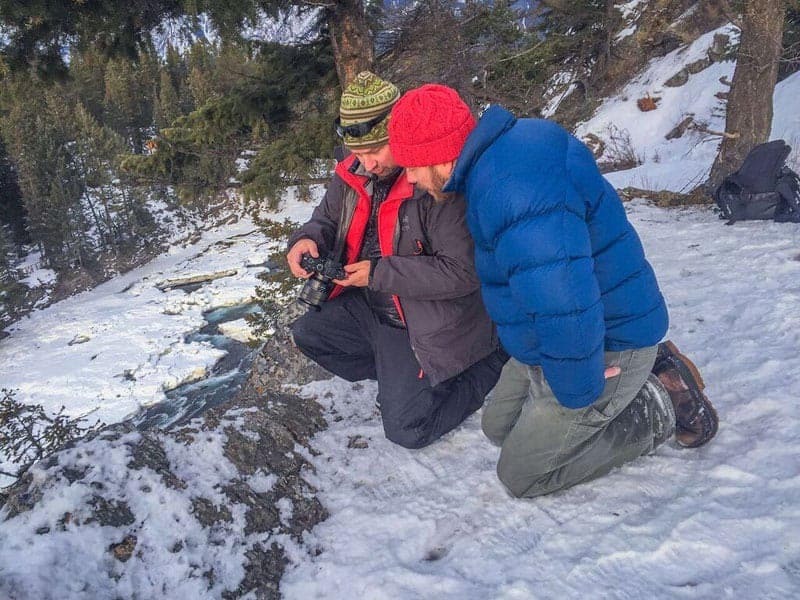 Discover Banff Tours offers guided scenic winter walks and let me tell you, this is one of the most stunning walks we've ever taken. It's a scene right out of Frozen! Our guide Magda gave us all ice cleats to fasten to our hiking boots to keep us from slipping on the icy steel catwalk that runs 2.5 miles through a picture-perfect limestone canyon. As you take in the surrounding views, you'll marvel at the frozen waterfalls, winding icy rivers and incredible rushing water that is so fast and furious, it refuses to solidify even in the deepest of freezes. Canmore became popular as the population grew in Banff National Park. There's a limit on how many people can live inside Banff, so as it expanded, people moved to Canmore to build a community. It's now a town filled with outdoor lovers and very healthy people. 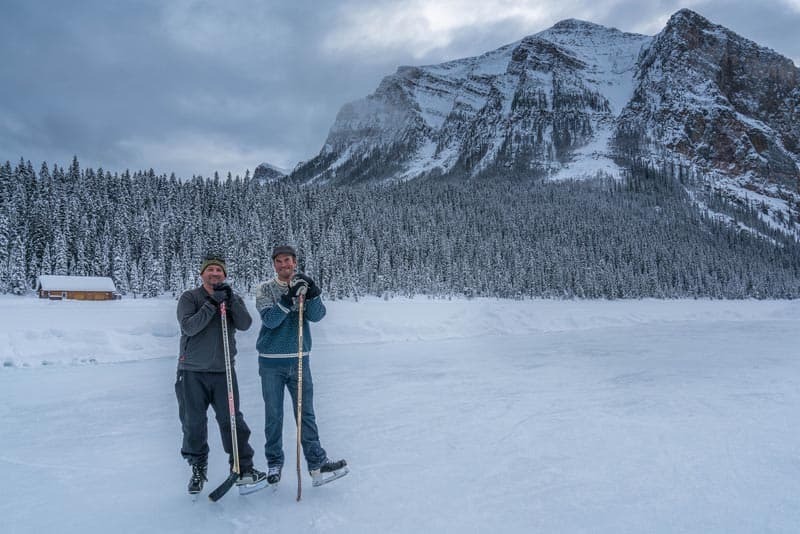 You can do a lot of activities directly from town and we went snowshoeing from Canmore. It wasn't long before we were surrounded by mountains and treated to spectacular views of the Three Sisters. 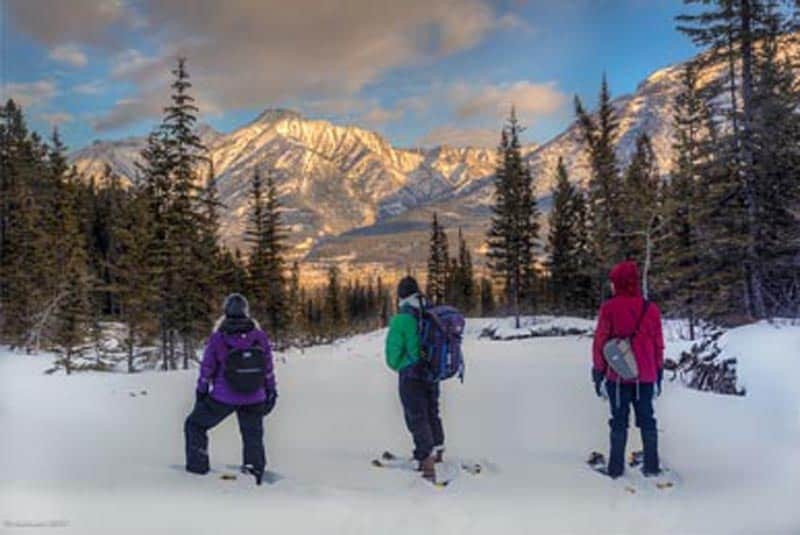 If you are new to snowshoeing, hire a guide to take you out to the backcountry safely. 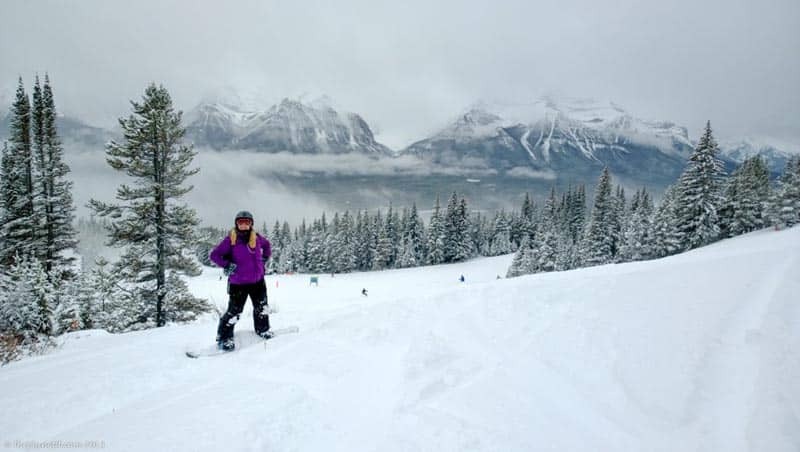 There is no going to Alberta in winter without going skiing or snowboarding. And Banff National Park houses three different ski slopes. 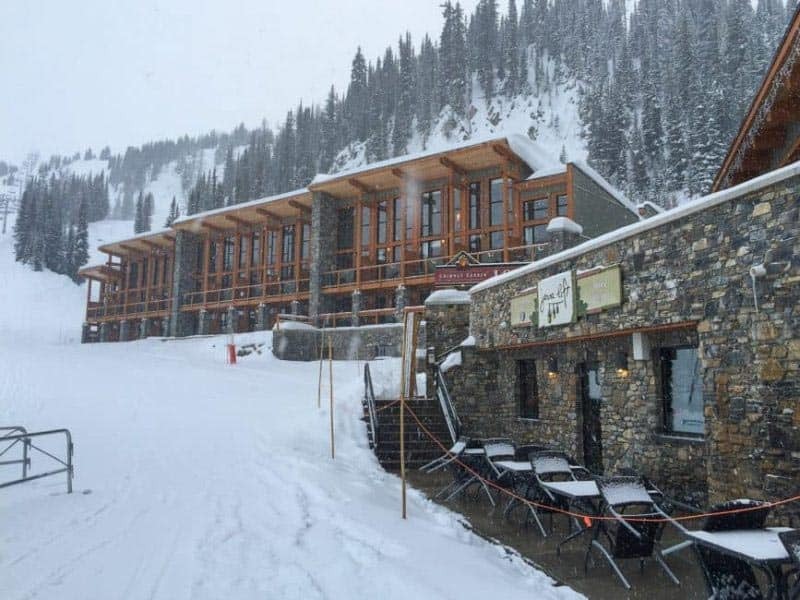 We love Sunshine Village because it has the Sunshine Mountain Lodge located right at the side of the hill offering the only ski in ski out adventures in Banff. 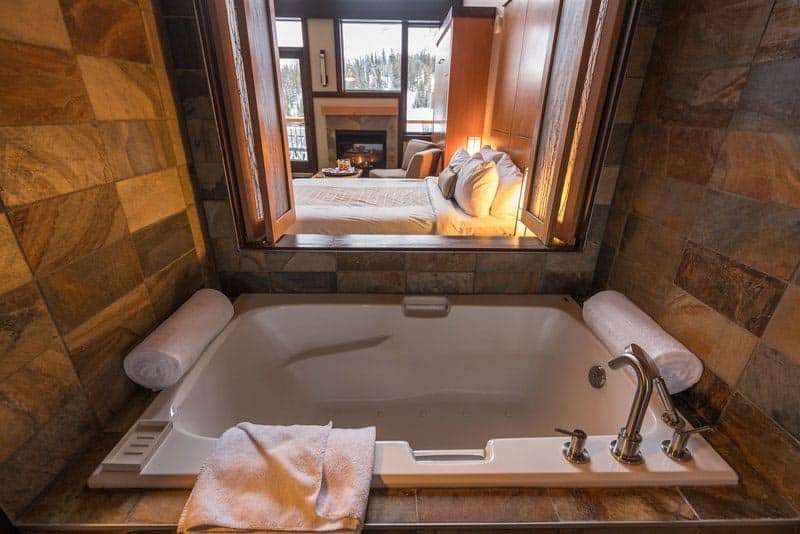 It also has Banff's largest hotel hot tub where after a day on the boards, you can soothe your aching muscles in the tub. 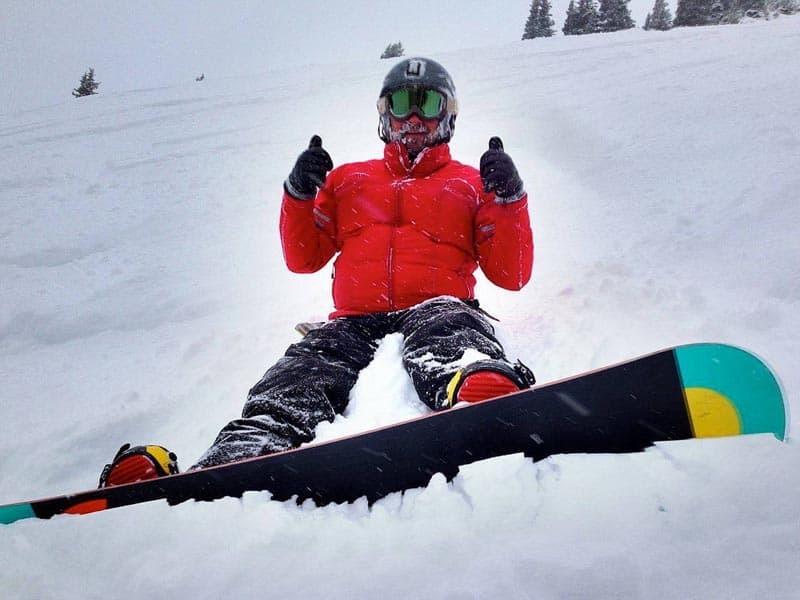 I would say that Sunshine Village is more of a skiers hill with many flats between slopes but it was still a blast as a snowboarder and I loved the covered chairlifts that kept us warm as we ascended into the thin mountain air. Norquay has the only night skiing in the area including a lit night terrain park. Located just 5 minutes from Banff it's a great place to go for a quick ride down the mountain. They even offer hourly passes! We visited Norquay for some snow tubing. 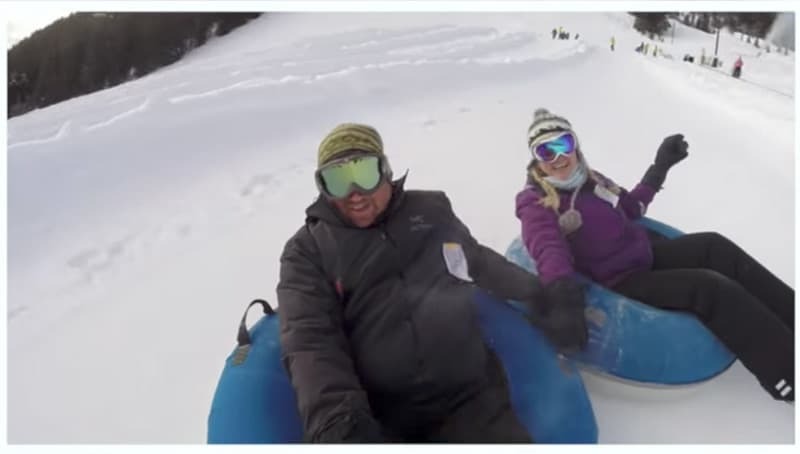 Dave and I like to describe snowtubing as the ultimate couch potato thrill ride. You get to wizz down the mountain at high speeds while spinning around in circles, but it requires very little effort from you. All you have to do is stand on the magic carpet as it takes you to the top of the hill and then sit on the tube as it slides down. I'm in! We didn't ski at Nakiska but if you are staying in Calgary this is the closest ski hill to the city. It has high speed chair lifts and is a great place for beginners. What says Canadiana more than sitting outside in the freezing cold, while staying toasty warm in a hot tube? 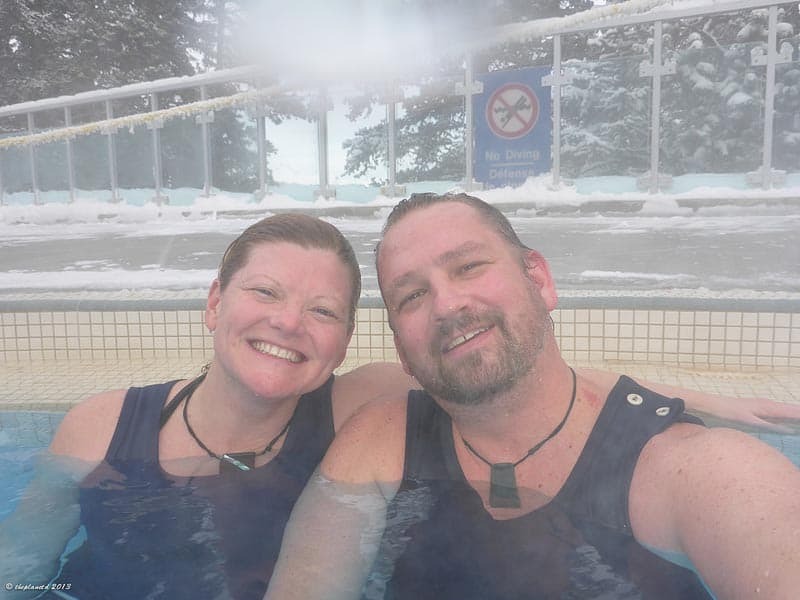 Banff Hot Springs is world famous for it natural springs and outstanding view! The Hot Springs aren't the most luxurious of destinations but they are a hoot to relax in the hot water looking at the landscape. Plus, you can rent old fashioned bathing suits and pretend you are an aristocrat visiting Alberta like they did back in the days when the great railway made its way through the Rocky Mountains. Places like the Fairmont Hotels in Lake Louise, Banff Springs and Calgary Pallisar offer spas and packages to pamper yourself. There's nothing better than a deep tissue massage after a day outdoors in the cold. See all the Romantic Things to do in Banff & Lake Louise watching this video! 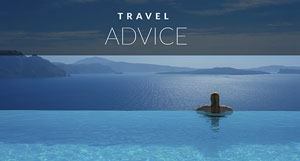 If your hotel doesn't have a spa, there are great spas in downtown Banff, Canmore and Calgary. Trust me, I never used to book spa days when traveling, and now I wouldn't do a trip without one! It's the perfect way to finally be able to relax when you are on vacation. A lot of us have a hard time turning off; a spa day will fix all that. Dave and I enjoyed a couples at Cedar and Sage in Banff and were very impressed with the massage therapist working away all the knots in our backs. the best part was, with it being located downtown, we could stroll the shops and enjoy a coffee afterward to truly get that sense of peace that one is looking for after a week of so many adventures. The Fairmont offers daily sleigh rides leaving from the front of the chateau and it takes you up the trail to the mouth of the glacier. As you ride along the trail with a blanket on your legs cozied up to the one you love, you feel as if you are in a movie. Didn't every Hollywood Christmas movie of the forties and fifties have a sleigh ride scene? And here we were living a movie moment. Bring home your own memories on a photo tour with Rocky Mountain Adventures. Alberta is known for its picturesque landscape attracting top professional photographers from around the world. Learn to capture your own photographs to take home and where to find the secret spots in the area on a winter photo tour with National Geographic award winning photographer Mark Unrau. You will be taken to the hottest photography spots for photographers, but you can also have the option of learning how to process your photos and optimizing them for print where you can hang your memories on your own walls. It's where the Canadian national park system began. Everybody knows about the Banff Hot Springs, well just a few hundred metres below is the source of those springs, the Cave and Basin National Historic Site. Walk through the long dark cave to an underwater warm spring where water that seeps from the surrounding rocks. It was discovered by railway workers back in 1883. 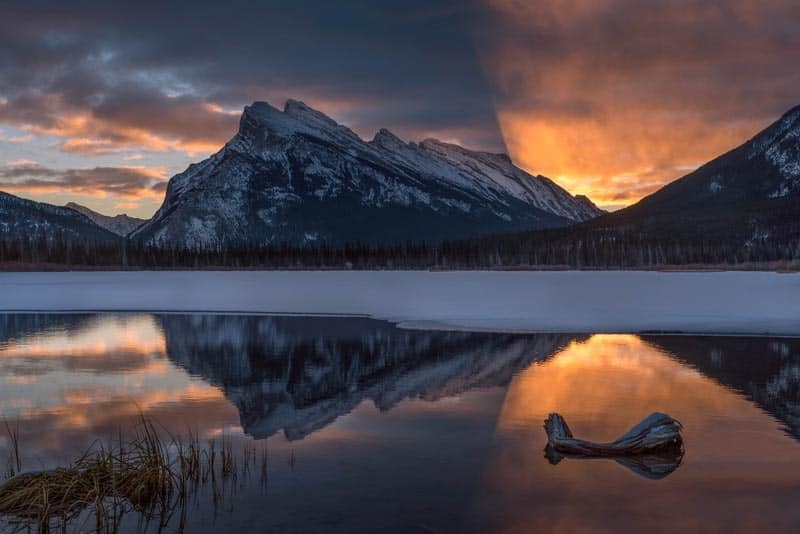 To attract visitors to Banff, Canada opened the first National Park and visitors flocked to swim and relax in the hot springs. Today it is a protected monument and there is no swimming in the pool to protect the endangered snails that inhabit the pool, but never fear, once you've learned about Canada's history you can head up to the Banff Hot Springs for a relaxing outdoor dip. We've eaten at a lot of restaurants in Alberta. Banff and Calgary have quite a food scene and they deserve their own posts. Well, we've already done one on Calgary here. But we thought we'd help you out on this post to get you started at our favourite picks for foodies. Banff has its own distillery and it's an excellent relaxed setting to enjoy wood fired cuisine while sampling a flight of cocktails. We loved the atmosphere in here making for the perfect gathering spot for apres ski or a romantic meal with the one you love. 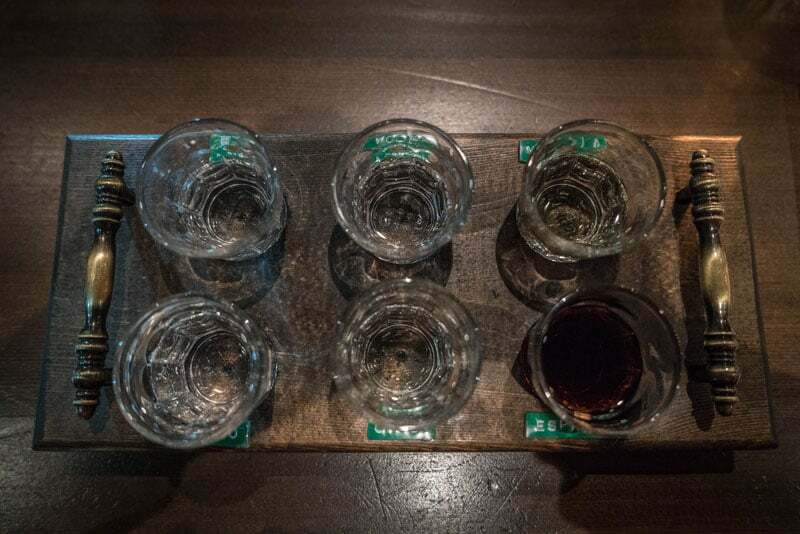 They offer distillery tours too! Check out their website for details. This small intimate restaurant only houses 9 tables so you can rest assured you'll have the best service in town. Family owned and operated, this farm to table menu creates local dishes with tender loving care. Make sure to ask for wine suggestions to pair with your meal. At the Trough, they take wine seriosuly. 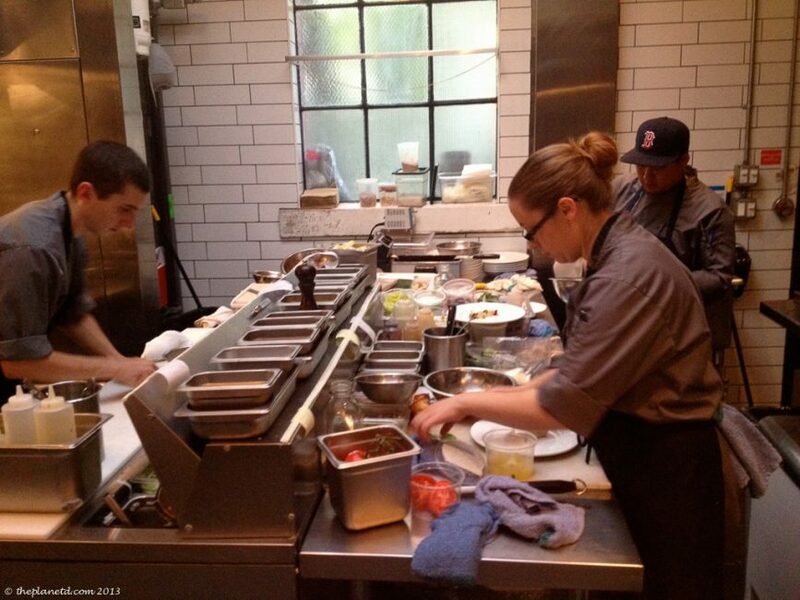 Chef Justin Leboe designed an open concept kitchen overlooking the restaurant where patrons can sit at the bar and watch the staff at work. In Alberta you can spend a lot of time eating meat and bison but Model Milk offers a choice of menu items with a European flare. While there is beef of the menu, we enjoyed selecting lighter dishes of fish and eggplant. 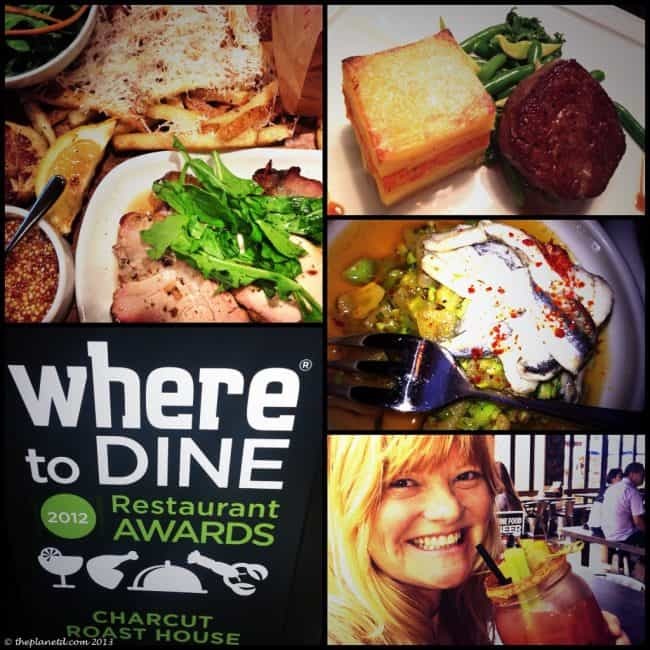 Read more about Calgary dining at The PlanetD favourite Calgary Restaurants. This unique restaurant is set in a heritage railway station. With a distinct Alberta menu of Bison Burgers, AAA Alberta Beef and Alberta lamb there is something for everyone. Don't worry if you're vegetarian, there's a killer vegetable lasagna on the menu too. There's a gift shop to browse memorabilia from a bygone era. We've had the luxury of trying many different places to stay in Banff and Calgary (admittedly not so much in Canmore) and these are our top picks for places to stay in Alberta. We stayed at this charming boutique hotel and truly felt the royal treatment. Let's just say, towel warmers in the bathroom? Oh yeah. Cabs to downtown ranged from $11 to $13 and being in the heart of Kensington Village allowed us to not have to leave the area for dinner or breakfast if we chose to stay close to our hotel. There were dining choices a plenty, and a lot of dining we did! We've stayed at the Fairmont in Calgary as well and are always fans of the Canadian operated luxury chain. 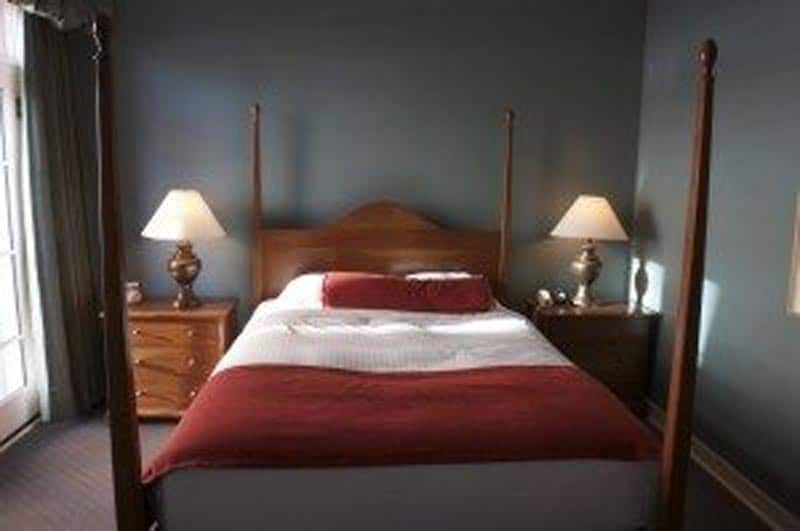 Situated just minutes from downtown, Buffalo Mountain Lodge offers free shuttles for guests to go out for dinner, drinks or downtown shopping. We loved building a fire in our room as we overlooked our Rocky Mountain view. Staff provides kindling, newspaper, matches, and wood to create the perfect fire for a romantic or cozy atmosphere. The Sleeping Buffalo Dining Room is a great choice for dinner featuring local fruits, vegetable, and grains plus hormone and antibiotic free bison and elk raised on their own game ranch. See if you can book a cooking demonstration at one of the restaurants like we did at Buffalo Mountain Lodge. I must admit, we stayed in the Holiday inn in Canmore and found it to be out of the way and a very average stay. If we were to go back to Canmore, we'd stay at Buffalo Mountain Lodge on the main downtown strip. With outdoor hot tubs, fireplace suites and kitchenettes in the room, it's the place I'd love to relax and enjoy. To end your romantic Lake Louise getaway, a romantic dinner is in order. 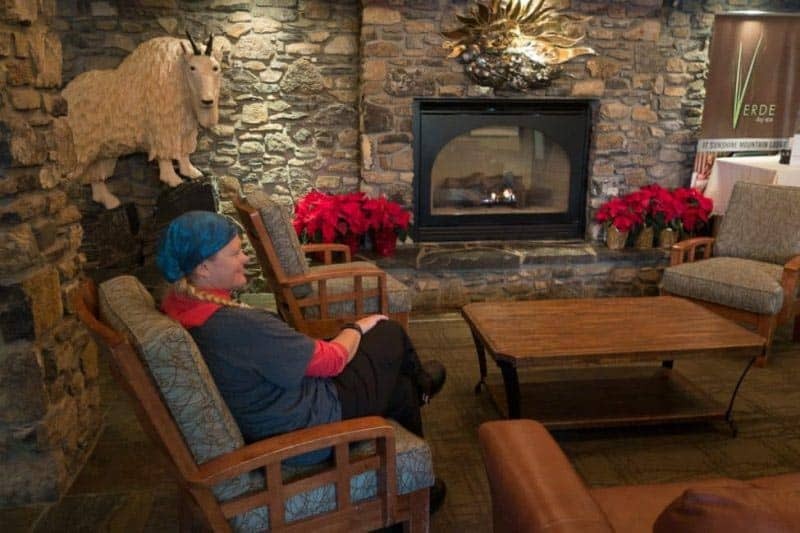 We went back to our own Deer Lodge to eat at the most noted dining rooms in Lake Louise. It's the perfect romantic dinner location. Soft lighting in a beautiful log cabin setting looking out at the Rockies. We ordered wine from their extensive wine list to go with our Alberta Beef and Rocky Mountain Charcuterie Platter. After dinner we retired to the fireplace to sip wine on the big leather couch and we even plucked out a few notes on the piano. Is that not romantic or what? This lodge is a little out of the way but that's exactly why we like it! Guests stay in private cabins ranging in size for couples to families with a spectacular view of Storm Mountain. Eight log cabins are set in a beautiful wilderness setting and are completely self sufficient with water, power, and sewer creating a sustainable green environment. Our cabin had a fireplace and sofa where we sipped wine reminiscing about our day. The dining was top notch serving an all Canadian menu with fine wine pairings. 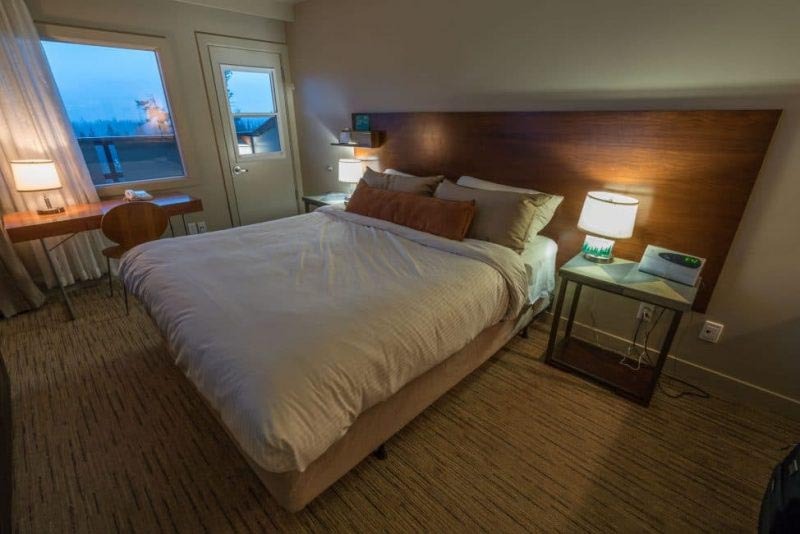 See our breakdown of Where to Stay in Banff for more hotel options. 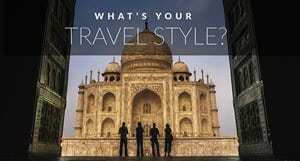 In partnership with Alberta tourism. 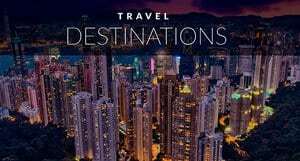 Visit Travel Alberta to plan your winter vacation. Have you done an adventures or activity in Alberta that we've missed? We're hoping to make it to Edmonton and Jasper for winter activities soon. We have explored Southern Alberta in the summer too! You may want to read our post about Following the Cowboy Trail south! Ever Heard of Skijoring? You have now! 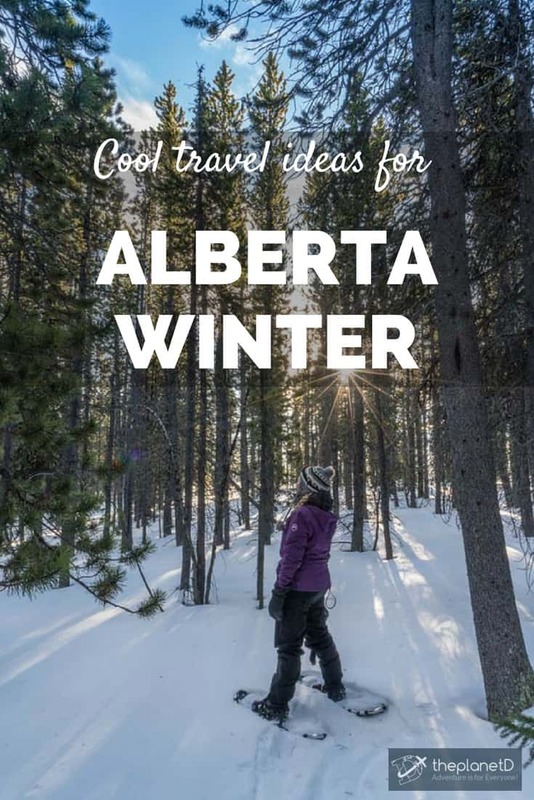 5 Responses to "Alberta Winter Travel Guide – Things to do from Calgary to Banff"
Calgary is a cool place but freezing brutal cold winters ! I remember when the Olympics were there so cool.! I agree with getting regular massages ? Thanks for sharing nice content with us. Keep on sharing such article, I love it lot. “A bunch of happiness and excitement”. This might be one of the best winter experience I’ve seen. Glad you’ve shared this. Anyhow, Looking forward to more of this. I made it to Banff and Jasper this summer for the first time. Visiting in winter would be a lot of fun. I didn’t know you could play hockey on Lake Louise!